Download "Guidance: Documentation Requirements for Waiver Requests under EPACT 2005 Section 701"
3 1 Introduction Increasing U.S. dependence on imported oil prompted Congress to include section 701 [42 U.S.C. 6374(a)(3)(E)] titled, Use of Alternative Fuels by Dual-Fueled Vehicles, in the Energy Policy Act (EPACT) of 2005 (Public Law ), which requires Federal fleets to replace petroleum use with alternative fuels. Under this provision, each Federal fleet covered by the alternative fuel vehicle (AFV) acquisition requirements under Title III of EPACT 1992 is required to use alternative fuel in its dual-fuel vehicles such as ethanol flexible fuel vehicles (FFV) or bi-fuel gasoline/gaseous fuel vehicles except where the fleet has received a waiver from the U.S. Department of Energy (DOE). 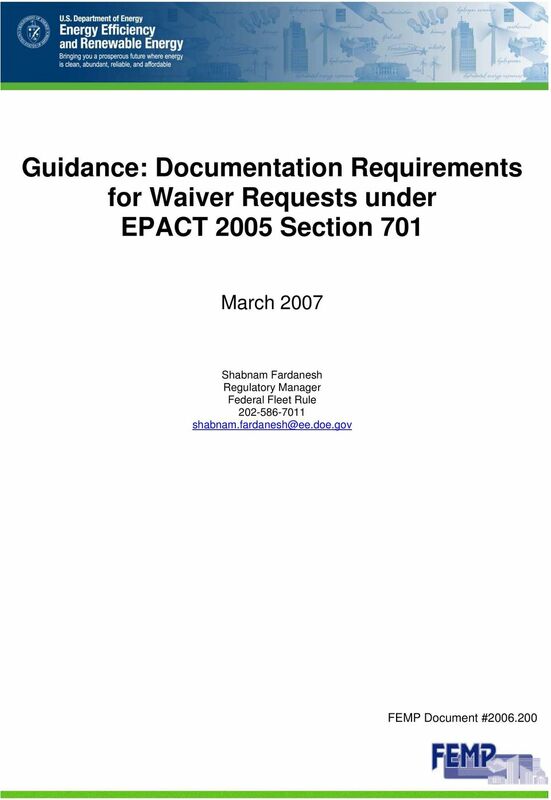 The purpose of this document is to provide guidelines to agencies to help them understand the requirements of section 701 and tell them how to apply for waivers from DOE. This guidance describes the process through which DOE will evaluate requests for alternative fuel use waivers by Federal agencies. It also describes the information DOE will require from agencies applying for waivers. 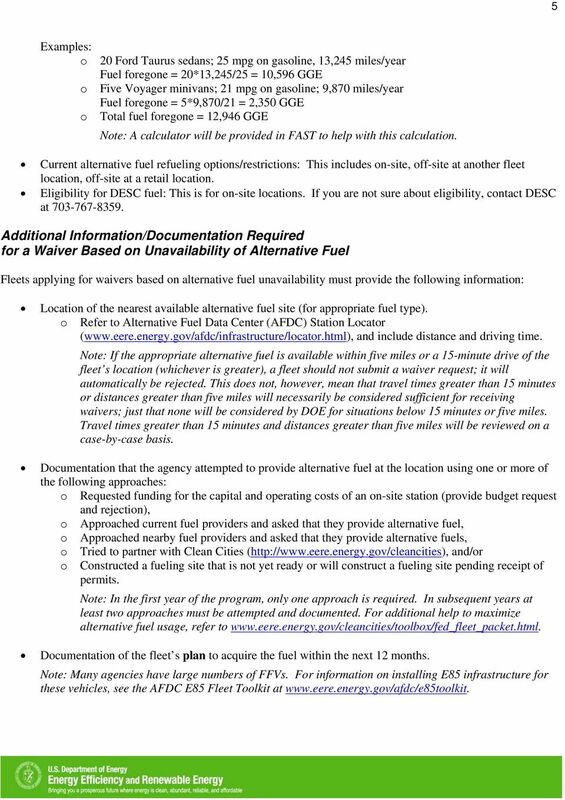 This document will be made available at www1.eere.energy.gov/vehiclesandfuels/epact/federal/index.html. General Guidance Applicability Waivers will only be granted for dual-fuel vehicles, i.e., flex fuel gasoline/ethanol, bi-fuel gasoline/natural gas (compressed and liquefied), or bi-fuel gasoline/liquefied petroleum gas (LPG) vehicles. More than 85 percent of the AFVs in the Federal fleet are FFVs. This waiver provision does not apply to the use of biodiesel or other types of alternative fuels. Vehicles that are excluded from the requirements of EPACT 2005 (such as emergency, law enforcement, and military tactical) are also excluded from this alternative fuel use requirement. Basis of Waivers Federal agencies may request a waiver based on either of the two exemption qualifications included in section 701, namely that the alternative fuel is not reasonably available or that the alternative fuel is unreasonably expensive. Not reasonably available is defined as alternative fuel that cannot be obtained within a 15-minute drive or within five miles (one way), whichever is greater. Unreasonably expensive is defined as alternative fuel costing at least 15 percent more than gasoline on a gasoline gallon equivalent (GGE) basis. Waiver requests that do not meet these criteria will not be considered. Furthermore, in cases where the nearest alternative fueling station for a dual-fuel vehicle is more than five miles or 15 minutes away but is along the usual route of the vehicle, the vehicle must use the fuel, and therefore, is not eligible for a waiver. Fleets should also consider fueling vehicles during off-peak hours when there is less traffic. Figure 1 outlines the waiver process. One consolidated waiver request, per covered agency per fiscal year (FY), will be considered. 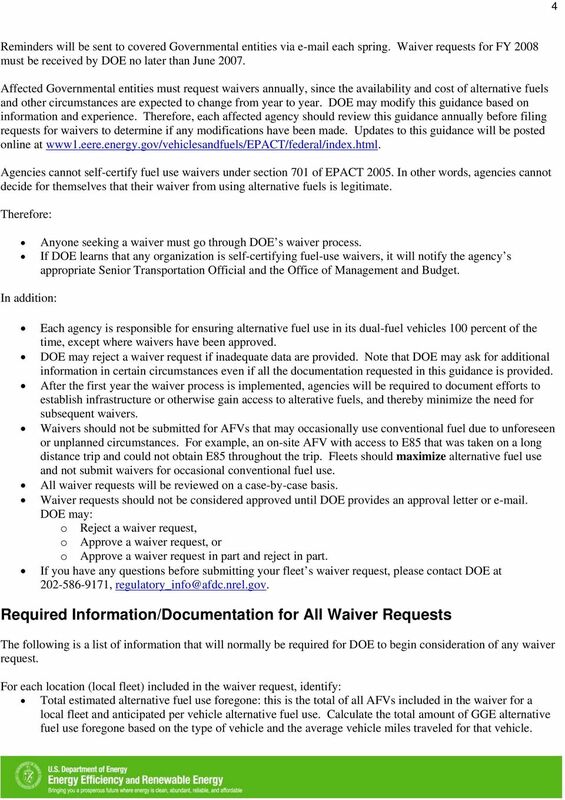 Waivers are filed by the designated Senior Transportation Official and are due to DOE in June of the prior fiscal year for which the waiver is requested. An agency s waiver application should include all requests for multiple local fleets within that agency s total fleet. A local fleet is defined as a group of vehicles reported as a unit in the Federal Automotive Statistical Tool (FAST). FAST is the Web-based reporting tool used by agencies to annually report compliance data and other related data to DOE and the General Services Administration. 4 2 Review and approval of a waiver will be based on the submission of sufficient documentation provided by the requesting agency. The data and supporting information is required for each local fleet included in the waiver application. 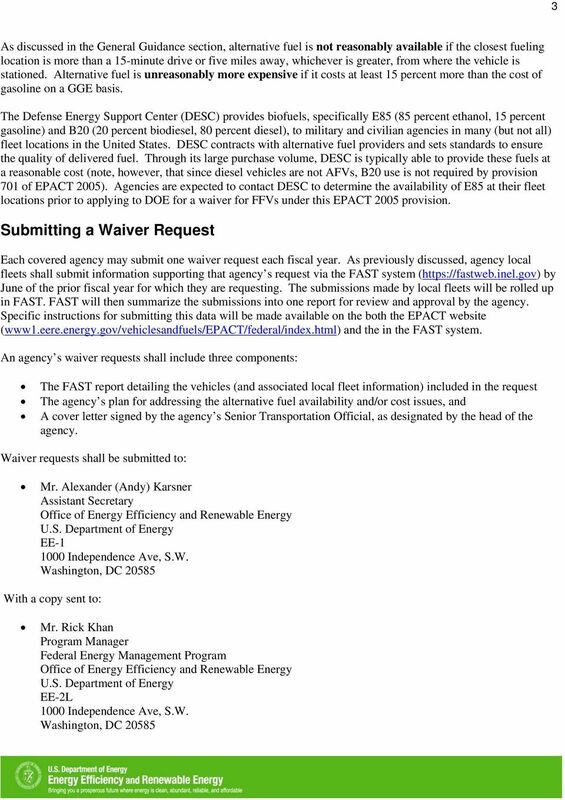 DOE may approve the waiver request for all, some, or none of the local fleets included in an agency s petition. All documentation supporting an agency s waiver request, under this provision, may be also audited by DOE. The purpose of the audit will be to confirm the lack of available alternative fuel and/or the unreasonable price of the fuel, as reflected in the waiver request. The following is general guidance that summarizes the basic procedural issues and approaches for submitting a waiver request from DOE. Figure 1. 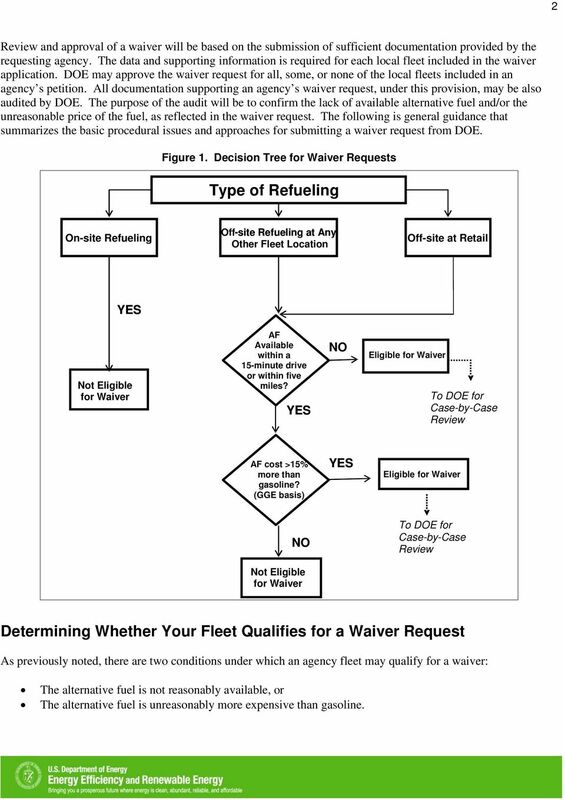 Decision Tree for Waiver Requests Type of Refueling On-site Refueling Off-site Refueling at Any Other Fleet Location Off-site at Retail YES Not Eligible for Waiver AF Available within a 15-minute drive or within five miles? YES NO Eligible for Waiver To DOE for Case-by-Case Review AF cost >15% more than gasoline? 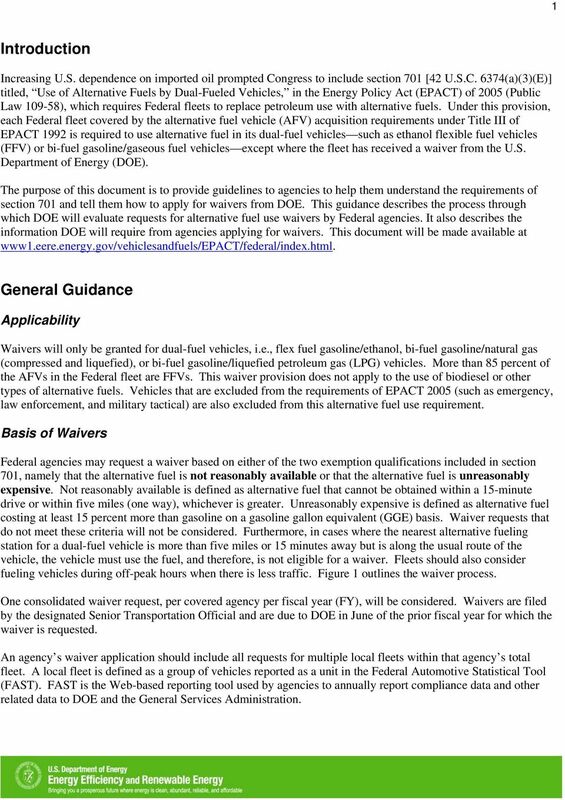 (GGE basis) YES Eligible for Waiver NO To DOE for Case-by-Case Review Not Eligible for Waiver Determining Whether Your Fleet Qualifies for a Waiver Request As previously noted, there are two conditions under which an agency fleet may qualify for a waiver: The alternative fuel is not reasonably available, or The alternative fuel is unreasonably more expensive than gasoline. 6 4 Reminders will be sent to covered Governmental entities via each spring. Waiver requests for FY 2008 must be received by DOE no later than June Affected Governmental entities must request waivers annually, since the availability and cost of alternative fuels and other circumstances are expected to change from year to year. DOE may modify this guidance based on information and experience. Therefore, each affected agency should review this guidance annually before filing requests for waivers to determine if any modifications have been made. Updates to this guidance will be posted online at www1.eere.energy.gov/vehiclesandfuels/epact/federal/index.html. Agencies cannot self-certify fuel use waivers under section 701 of EPACT In other words, agencies cannot decide for themselves that their waiver from using alternative fuels is legitimate. Therefore: Anyone seeking a waiver must go through DOE s waiver process. If DOE learns that any organization is self-certifying fuel-use waivers, it will notify the agency s appropriate Senior Transportation Official and the Office of Management and Budget. In addition: Each agency is responsible for ensuring alternative fuel use in its dual-fuel vehicles 100 percent of the time, except where waivers have been approved. DOE may reject a waiver request if inadequate data are provided. Note that DOE may ask for additional information in certain circumstances even if all the documentation requested in this guidance is provided. After the first year the waiver process is implemented, agencies will be required to document efforts to establish infrastructure or otherwise gain access to alterative fuels, and thereby minimize the need for subsequent waivers. Waivers should not be submitted for AFVs that may occasionally use conventional fuel due to unforeseen or unplanned circumstances. For example, an on-site AFV with access to E85 that was taken on a long distance trip and could not obtain E85 throughout the trip. Fleets should maximize alternative fuel use and not submit waivers for occasional conventional fuel use. All waiver requests will be reviewed on a case-by-case basis. Waiver requests should not be considered approved until DOE provides an approval letter or . DOE may: o Reject a waiver request, o Approve a waiver request, or o Approve a waiver request in part and reject in part. If you have any questions before submitting your fleet s waiver request, please contact DOE at , Required Information/Documentation for All Waiver Requests The following is a list of information that will normally be required for DOE to begin consideration of any waiver request. For each location (local fleet) included in the waiver request, identify: Total estimated alternative fuel use foregone: this is the total of all AFVs included in the waiver for a local fleet and anticipated per vehicle alternative fuel use. Calculate the total amount of GGE alternative fuel use foregone based on the type of vehicle and the average vehicle miles traveled for that vehicle. 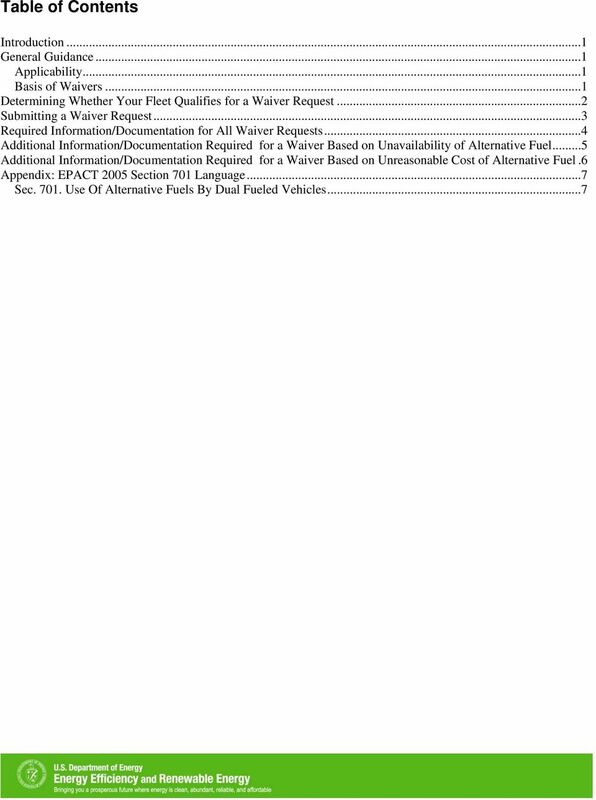 8 6 Additional Information/Documentation Required for a Waiver Based on Unreasonable Cost of Alternative Fuel Fleets applying for waivers based on the unreasonable cost of alternative fuel must provide the following information: Costs of alternative fuel and conventional fuel. o For requests during the first year of waiver program (for FY 2008), provide current fuel prices for both alternative and conventional fuel based the most recent quarterly average of monthly data. o During future years (FY 2009 and beyond), provide current fuel price of both alternative and conventional fuel, and show at least quarterly price comparisons based on monthly averages for the past year. o Indicate data source(s) for fuel costs, including: Date of fuel prices noted. This should be the same for alternative fuel and conventional fuel prices. Location of the fuel prices noted. This should be the same for alternative fuel and conventional fuel prices. Location of available alternative fuel refueling site(s). o Refer to AFDC Station Locator ( and include distance and driving time. 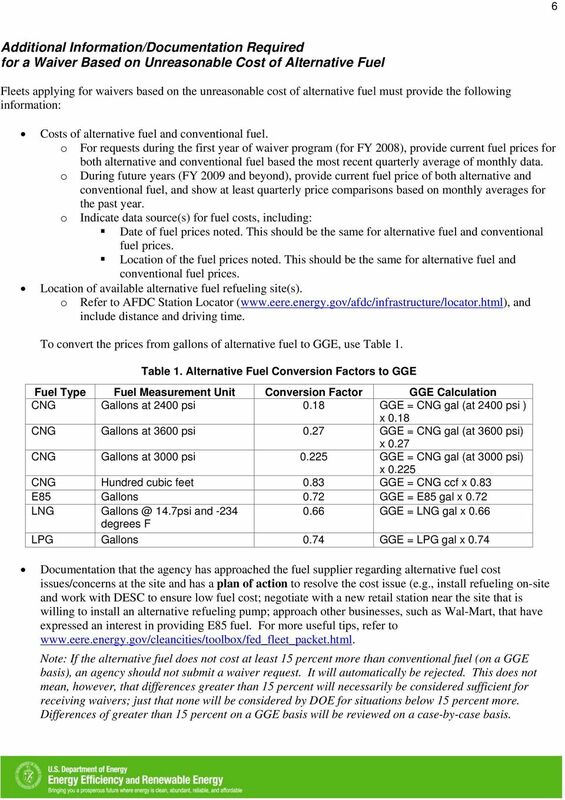 To convert the prices from gallons of alternative fuel to GGE, use Table 1. Table 1. Alternative Fuel Conversion Factors to GGE Fuel Type Fuel Measurement Unit Conversion Factor GGE Calculation CNG Gallons at 2400 psi 0.18 GGE = CNG gal (at 2400 psi ) x 0.18 CNG Gallons at 3600 psi 0.27 GGE = CNG gal (at 3600 psi) x 0.27 CNG Gallons at 3000 psi GGE = CNG gal (at 3000 psi) x CNG Hundred cubic feet 0.83 GGE = CNG ccf x 0.83 E85 Gallons 0.72 GGE = E85 gal x 0.72 LNG 14.7psi and GGE = LNG gal x 0.66 degrees F LPG Gallons 0.74 GGE = LPG gal x 0.74 Documentation that the agency has approached the fuel supplier regarding alternative fuel cost issues/concerns at the site and has a plan of action to resolve the cost issue (e.g., install refueling on-site and work with DESC to ensure low fuel cost; negotiate with a new retail station near the site that is willing to install an alternative refueling pump; approach other businesses, such as Wal-Mart, that have expressed an interest in providing E85 fuel. For more useful tips, refer to Note: If the alternative fuel does not cost at least 15 percent more than conventional fuel (on a GGE basis), an agency should not submit a waiver request. It will automatically be rejected. This does not mean, however, that differences greater than 15 percent will necessarily be considered sufficient for receiving waivers; just that none will be considered by DOE for situations below 15 percent more. Differences of greater than 15 percent on a GGE basis will be reviewed on a case-by-case basis. 9 7 Appendix: EPACT 2005 Section 701 Language Section 701. Use of Alternative Fuels by Dual-Fueled Vehicles Section 400AA(a)(3)(E) of the Energy Policy and Conservation Act (42 U.S.C. 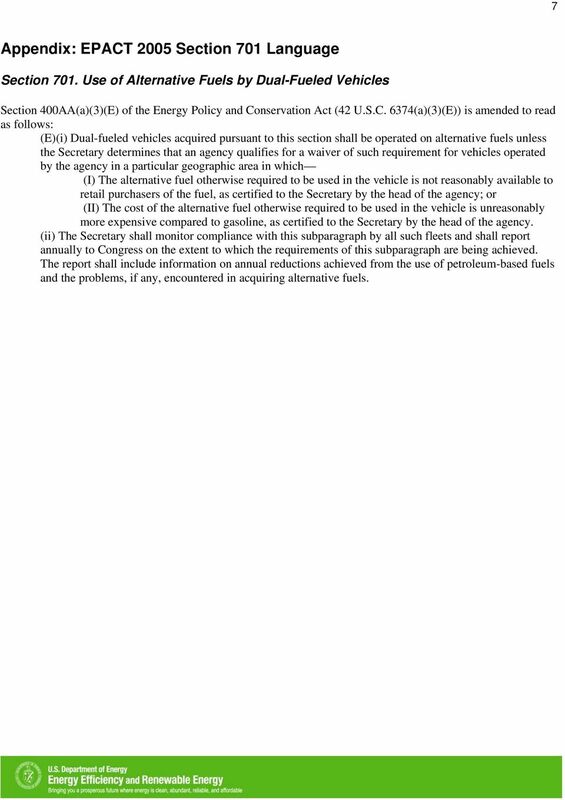 6374(a)(3)(E)) is amended to read as follows: (E)(i) Dual-fueled vehicles acquired pursuant to this section shall be operated on alternative fuels unless the Secretary determines that an agency qualifies for a waiver of such requirement for vehicles operated by the agency in a particular geographic area in which (I) The alternative fuel otherwise required to be used in the vehicle is not reasonably available to retail purchasers of the fuel, as certified to the Secretary by the head of the agency; or (II) The cost of the alternative fuel otherwise required to be used in the vehicle is unreasonably more expensive compared to gasoline, as certified to the Secretary by the head of the agency. (ii) The Secretary shall monitor compliance with this subparagraph by all such fleets and shall report annually to Congress on the extent to which the requirements of this subparagraph are being achieved. The report shall include information on annual reductions achieved from the use of petroleum-based fuels and the problems, if any, encountered in acquiring alternative fuels.